IPX8 Waterproof - IPX8 waterproof with triple sealing design to ensure waterproof protection, up to a depth of 6 feet. Multipurpose - Perfect for swimming, sunbathing, kayaking, boating, fishing, hiking, camping or any other outdoor activities. Large capacity - Ideal for holding your phones, watches, cameras, cash, keys, documents and other valuables. 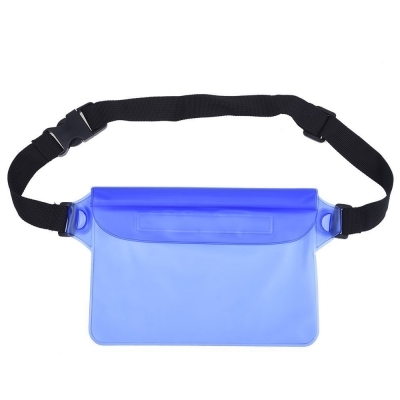 Portable - Lightweight design and adjustable waist strap makes it convenient and comfortable to carry. Made of highly durable PVC material to protect your personal items from water, dust, sand and dirt. Whether you are out for swimming, sunbathing, kayaking, boating, fishing, or hiking, Mudder waterproof pouch is an ideal companion. It offers a comprehensive protection for your phone, watch, camera, passport, cash, credit card, keys, documents and other valuables.Made of highly durable material with triple sealing, Mudder waterproof pouch can secure your personal items tightly, keeping them from water, dust, sand and dirt. The large capacity (8.6 x 5.9 inches) allows you to just throw your phones, watch, camera, passport, cash, credit card, keys, documents and other valuables in without worrying about the space.With adjustable waist belt, Mudder waterproof pouch is easy and comfortable to carry.